Culinarily speaking, Jackson Heights and environs is many things–mostly good–but it’s not a pizza neighborhood. 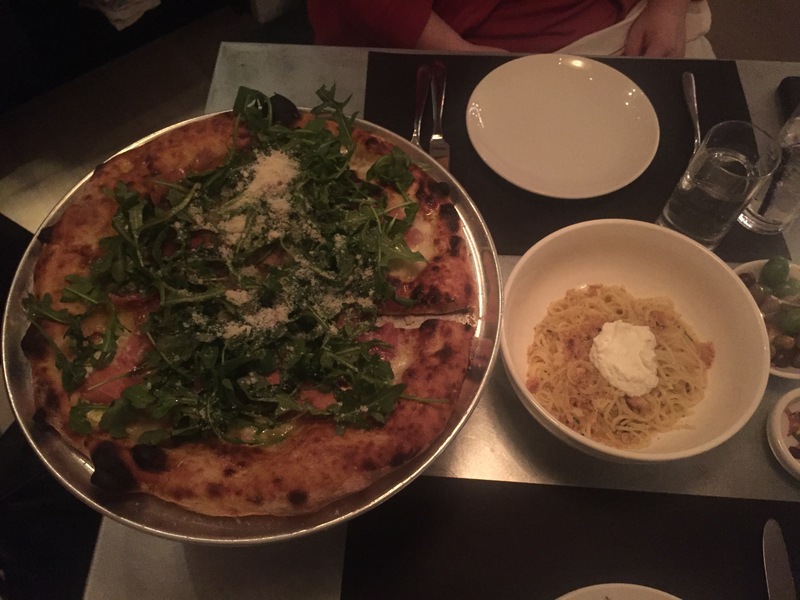 (It’s not always you don’t know what you’ve got till it’s gone–I knew I had it good when Best Pizza, Forcella and Motorino were all within blocks.) It’s not a great sign when the restaurant you’re greeted by upon approaching the 74th St. and Roosevelt Ave. transit hub is a Famous Famiglia. Salza, two blocks deep into Woodside, isn’t exactly solving any pizza woes from an artisan standpoint. However, they’ve captured my heart in attempting to embrace more than 20 regions of the world with made-up pies, some logical, many less so. As a young grade-schooler, I would get creative with scrambled eggs, trying to incorporate sauces found in the refrigerator. Salsa transformed beaten whites and yolks into Mexican eggs, a few shakes of soy sauce made them Chinese, and teriyaki meant Japanese, of course. Those were the only condiments we had beyond ketchup, mustard, and Catalina dressing, so MasterChef Junior this was not. Salza has no such constraints. A Norwegian pizza can contain shrimp, penne and vodka sauce, an Imperial Dragon may incorporate soy sauce and snow peas and an Inca Beef goes lomo saltado with steak strips and french fries. (Does anyone outside of NYC know what vodka sauce even is? Ok, doing a completely unrelated search for new breed Jello shots, I discovered penne a la vodka on a Portland happy hour menu, so I guess this is a personal blind spot.) Anyone familiar with the Australian custom of adding beets, pineapple and fried egg to burgers might be shocked to see this country’s pizza showcasing sour cream, ham, and corn. Me, I love pineapple on pizza, a source of mild shame in NYC. 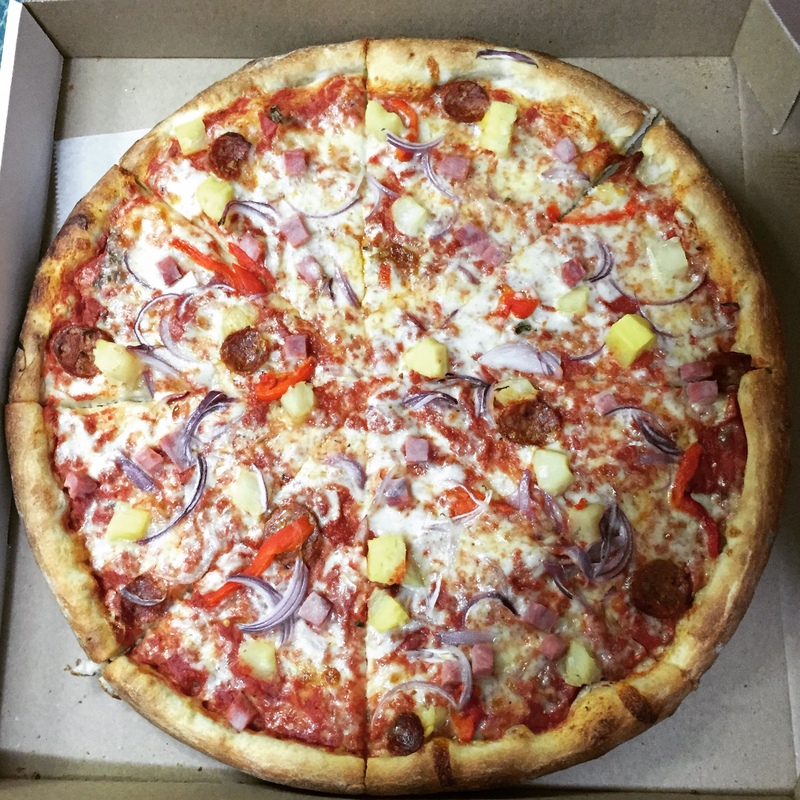 Of course, there is a Hawaiian at Salza. But considering Woodside is NYC’s “Little Manila,” a Pacquiao Punch, gilding the gauche standard with spicy sausage (not longanisa, fyi) and red peppers and onions, is really quite sensible when you think about it. Welcome to the world via Queens. Confession: I’ve never eaten at a Gray’s Papaya in my close-to-sixteen years in this city. (Deeper confession: I don’t like hot dogs–and yes, I also eat pizza with a fork and sometimes a knife, too.) More embarrassingly, though, since I kind of consider Thai food to be my thing, is that I had never eaten at Thailand’s Center Point until this year. I know, I know. It’s what Sripraphai used to be, it’s mom and pop (or rather mom and daughter), there aren’t hordes and a ticketing system, it’s BYOB. All valid arguments. I’m probably one of the last remaining Sripraphai apologists. That’s just where I’ll go if I’m in the neighborhood. Center Point does have charm. It’s more personable, and I appreciate the thrift of drinking your own bottles of Brooklyn lager (four cocktails at Bar Below Rye afterward cost more than dinner) though it’s also impossible render a verdict after three dishes–three dishes that came sequentially, the next arriving only after the former was finished. It wasn’t clear if this pacing was intended or just how the kitchen was handling orders. I like being able to take a bite here and there. The crispy fried papaya salad is kind of the answer to Sripraphai’s crispy watercress salad; a weird treatment that works. It’s essentially a som tum with seafood (squid, shrimp, mussels) except that the unripe fruit has been battered and fried. I’m all for this. You lose the freshness but gain a different kind of crunch. This is a papaya salad for temperatures sinking dangerously close to single digits. The dressing wasn’t overly sweet, a common complaint, but it was heavy on the lime and garlic with no heat for balance. Of course, that can be remedied with ground chiles or chile-infused fish sauce from the condiment caddy shared among the handful of tables. It wasn’t that my request for spicy (and no, I’m not trying to prove something by obliterating the taste of the food) was misunderstood because the next two dishes, both pork because of lack of foresight, were just the right amount of hot; appreciable, some bites more tingly than others, but not brutal. 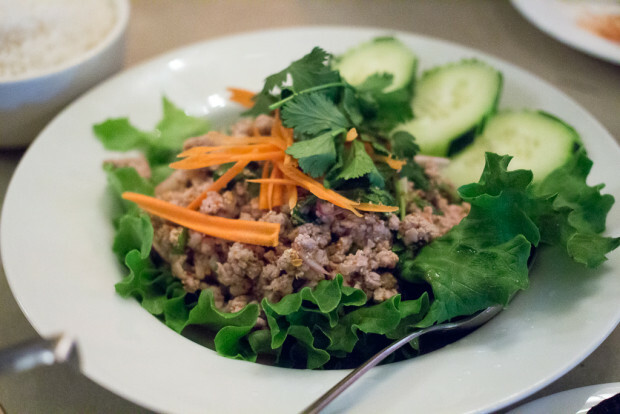 The larb was a good rendition with meat that was just a shade away from medium-rare. Make sure to scoop the liquid from underneath the lettuce because that’s where the heat hides. I can never not order crispy pork. It’s always going to happen if it’s on the menu, which is why the larb should’ve been something else like the also rich-and-fatty duck that I didn’t notice on the specials board until the end of the meal. 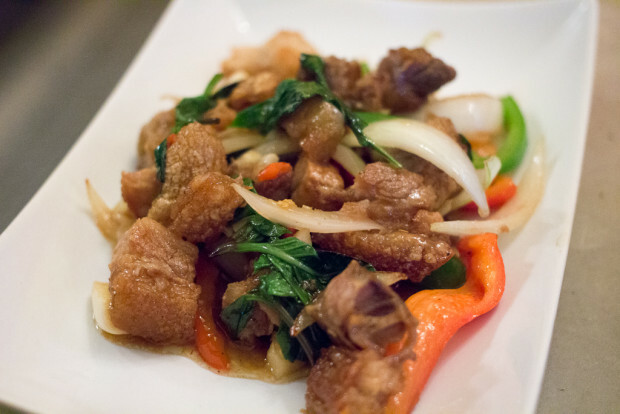 Here, the fried chunks of pork were stir-fried with chile and basil, a classic. While it tasted unmistakably Thai, there was also something vaguely Chinese-y about this version compared to Sripraphai’s. It’s not like five-spice powder or soy sauce jumped out. All I can attribute it to is that Sriprahai’s is drier with fewer distractions while the Center Point style includes thickly sliced onions and green and red peppers more prominently. It was a very likeable dish, nonetheless. I am certain I will return because there is no shortage of people who enjoy eating here that I could tag along with. There is much to be explored on the menu still. 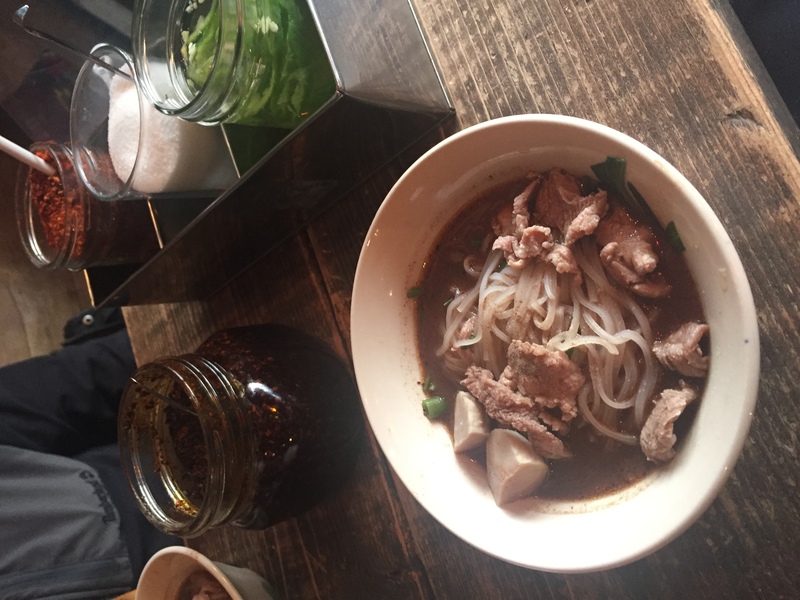 Even though it's crowded on weekend evenings, the spice level isn't always what it could be and worthy nearby competitors aren't scarce, I still rely on Sripraphai for a regular Thai food fix. It's the crispy watercress salad. I know this dish in and out. Yet, on this Sunday afternoon visit (my second day in a row in Woodside—first for Jollibee, then back to Queens to replace a fried cable box. I need my True Blood and Mad Men. Did you know that the Time Warner office inside the Queens Center Mall is the only location in the entire city open on Sundays?) I was served a slightly different rendition than normal. There was an unusually tall, fluffy pile of battered watercress sitting on top. More generous than I've seen before, the translucent golden stack gave the dish a more bountiful feel. The ratio might seem off, but once you mix things up and baste the herbs, chicken and seafood with the intensely savory goop resting at the bottom of the plate, the components settle down and mellow into a nice still-crunchy sog. And the small ceramic dish filled with both chopped cashews and a small handful of whole nuts? It blew my mind. Well, almost. Self-garnishing is new. I don't even recall a crushed nut element in salads past. I liked it. In a reversal, the drunken noodles did not come with the typical little dish of chile-spiked fish sauce. Shenanigans. Is the Sunday chef putting their own spin on the standards? Next time, I'm in Woodside, I will force myself to try Centerpoint Thai, one block west of Sripraphai. 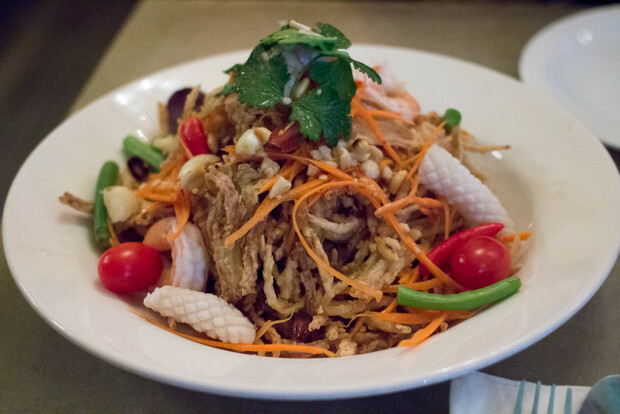 There's no way that tales of a battered, fried papaya salad can go uninvestigated. Before indulging in a stream of compulsory (only to me) vacation dining recaps, I must first mention NYC’s Thai stalwart, Sripraphai. 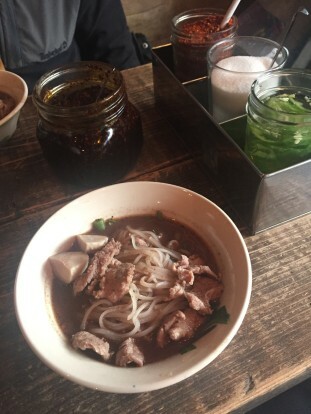 I dine there maybe every month-and-a-half and will always defend it against downhill alerts no matter how big they get for their britches, but haven’t posted about it in ages because I always order the same things and find the food to be generally consistent. No need for an update. However, I did want to assess the restaurant post-Thailand vacation. While Sripraphai’s menu strays in many directions (northern khao soi and larb as well as the formidable southern curry) the bulk of what they serve is very close to what you’ll find in Bangkok: rich curries and multi-textured salads that skew slightly more sweet than hot. Awesome and never tiresome. I could eat this food every single day and not get bored (even though I indulged in some Sizzler and German fare in Bangkok). By sweet, I don’t mean the lime juice-and-sugar dominated papaya salads of Brooklyn. Sripraphai still manages more spice than your corner Thai joint (though occasionally they go too tame–I’m not sure what to think of this Chowhound code word business). Their heat level and style of cooking is very much in line with Bangkok’s renowned Chote Chitr, which I finally got to try. Yet when we went three hours south to beachy Hua Hin, the non-touristy food was jarring and outright incendiary. I loved it, but never encountered that chile intensity in Bangkok. You probably won’t find it at Sripraphai either. On my last visit just before heading out of town I decided to go wild and order something I’d never had before. Meet the bbq pork salad. Slightly different than the Thai salads I normally eat, this fatty grilled pork mélange is very limey and coated with roughly chopped garlic. While balanced, I prefer more sweet and hot. Like the dressing on he crispy Chinese watercress salad that never gets old. There’s just too much going on to get tired of it. Shrimp, shredded chicken, toasted cashews for crunch and dominate battered, fried watercress that manages to never be greasy. The best part might be the “goop” (that’s what we call it) that pools at the bottom of the plate from the dressing, sliced shallots, chopped chiles, cilantro and bits of pliable fallen-off batter on the verge of turning soggy. Never waste the goop. I could eat it over rice. Looking at this photo makes me very sad that I have vegetarian chicken salad sandwich and yogurt for lunch. 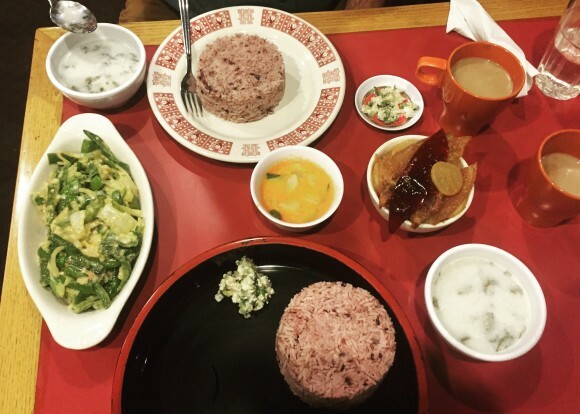 I have never seen this dish in Thailand (I’ve only been twice, so hardly scouring the nation) or encountered it elsewhere in the US. Maybe it’s a bastardized invention. 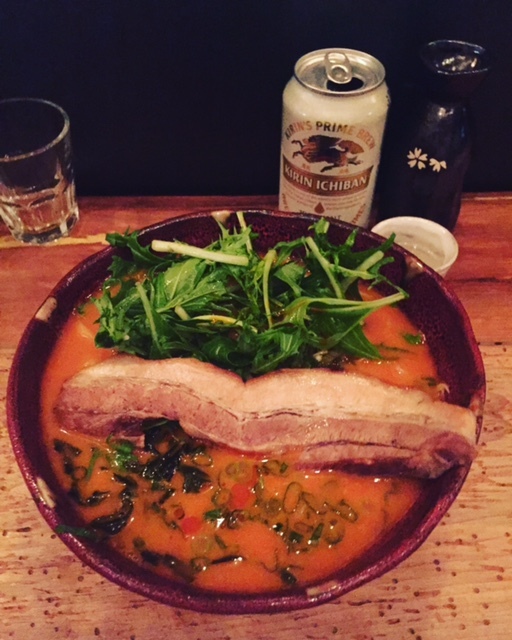 Crispy pork is always a must. The more decadent version is stir-fired with chiles and basil. When I’m pretending to be healthy (you know, ordering two pork dishes at one meal) I pick the porcine nubs tossed with Chinese broccoli. Though flavored with little more than garlic and oyster sauce (maybe a little soy sauce too), there is nothing dull about this meat-enlivened vegetable dish. Then a curry. My favorite is the thick one with duck, eggplant and bamboo shoots. This is a typical panang, one of the big three, with beef. Rich, just a little spicy and covered with torn lime leaves and a drizzle of coconut cream. Nobody dislikes panang curry. No desserts this time around, though when I do pick up a little plastic container to go it’s usually pumpkin custard squares. I checked out the new Filipino bakery catty-corner to Sripraphai but wasn’t feeling inspired by any of the ensaimadas. I just wanted a slice of ube chiffon cake. I honestly didn’t have high hopes for a Valentine’s Day treat involving Chickenjoy or spaghetti studded with frankfurters at Jollibee on opening day. In the Philippines the homegrown chain is way bigger than McDonald’s. There’s serious nostalgia at work (though not for me, obviously). I could see from blogs that the East Coast’s first branch in Woodside, Queens was tempting visitors from as far as Toronto. James’ Pinoy coworker was packing up his family and heading in from New Jersey’s outer reaches. I could stand to wait a few weeks for the hype to die down. Remember how quickly Pollo Campero mania faded? After the initial ruckus, the Guatemalan fried chicken chain couldn’t even sustain enough business in Sunset Park to stay open (there’s still one in Corona, though). So, we had an impromptu late lunch at Sripraphai instead. No waiting and no photos necessary since I order nearly the same thing every time (crispy watercress salad, crispy pork with chile and basil, drunken noodles and a curry—this time a super bony, more fiery than usual catfish version with apple eggplants). Since no one gave me holiday candies I gifted myself with assorted mithai from Delhi Palace. These colorful sugar bombs will kill you, total diabetes in a box (seriously, everyone thinks that blacks and latinos are the kings of insulin resistance, but Indians have the highest rate of Type 2 diabetes in the city, which I only remember because the New York Times’ article on the topic last year, “Bedeviled by the Sugar Sickness” was illustrated with a photo of Delhi Palace) but I love the creamy sweet assault on rare occasions. I almost would’ve forgotten it was Valentine’s Day if I hadn’t been handed plastic wrapped flowers by a waitress at Sripraphai just before she ran out. By the time we were done eating, the usual Saturday night hordes had amassed in the lobby and outside…and yep, there was still a massive queue at Jollibee. I’ll be back.